The Northeast Affiliate of Susan G. Komen for the Cure®, or Komen Northeast Ohio, is part of Susan G. Komen for the Cure®, the world’s largest grassroots network of breast cancer survivors and activists. Our Mission is to save lives and end breast cancer forever by empowering people, ensuring quality care for all and energizing science to find the cures. Komen Northeast Ohio serves 22 counties in Northeast Ohio by funding breast cancer education, screening and survivor support programs. Seventy-five percent of the funds received remain here in Northeast and the remaining 25 percent helps fund national research to discover the causes of breast cancer and ultimately its cures. In March 2010, Komen Northeast Ohio was honored as the “Affiliate of the Year” by the national organization in recognition of the effective stewardship of donor funds and impact in the community. Since 1994, Komen Northeast Ohio has raised $20 million to provide funding and support to Northeast Ohio agencies working to end breast cancer. As excellent financial stewards, general administrative and overhead expenses, excluding fundraising expense, are held to less than 10%. Each year the Komen Race for the Cure raises significant funds and awareness for breast cancer, celebrates breast cancer survivorship and honors those who have lost their battle with the disease. 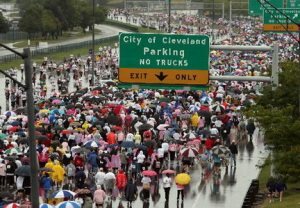 2012 marks the 19th Annual Susan G. Komen Cleveland Race for the Cure and the 1st Susan G. Komen Akron Race for the Cure. Your generous donation will help us fulfill The Susan G. Komen for the Cure promise: to save lives and end breast cancer forever by empowering people, ensuring quality care for all and energizing science to find the cure.